Lately fewer young people see themselves working in the government. For many, the dream is to move to California to run a hot, new startup company. This change in career preference among millennials has caused a rift in the otherwise-stable public sector job market. For tech-savvy programmers, startups can offer attractive perks like loose deadlines and high starting pay, while their comparable public sector jobs appear less exciting and too bureaucratic. This has caused a skills gap within the government workforce and an ongoing snowball effect that leaves new classes of programmers and designers uninterested in the public sector. The Obama administration has begun to address this problem with creative recruiting and by promoting public-private sector partnership in the tech world. The White House recruiting message appeals to prospective candidates’ sense of adventure. Defense Secretary, Ashton Carter, took a trip to Silicon Valley recently to persuade the next generation of app developers that their efforts could be used to protect the homeland. The focus of his pitch was on improving trust between the public and information gathering bodies, but he also made the Pentagon look more attractive to potential employees by stressing the large impact on national security their work could potentially have. To maintain these career bridges, there are also efforts to further strengthen public-private partnerships between the technology and government worlds. 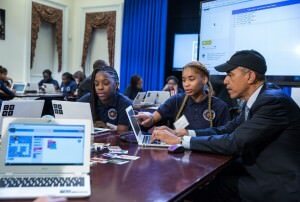 The White House created the U.S. Digital Service aimed at decreasing government inefficiency by using innovative and technology-driven solutions. The participating government employees include individuals that are at the top of the tech industry. The White House hopes that these leaders serve as role models to prospective candidates. As part of the Small Business Act roll out, President Obama also launched the Startup America Initiative to promote innovation and job growth in the startup market. Specifically, it recognizes the unique value of startups and outlines tax credits, education opportunities, and other programs aimed at helping the industry to continue to flourish. While this effort directly strengthens the private sector, the program can bolster the government’s image surrounding this relatively new employment sector. Here at Nexight we specialize in public-private sector relationships. We have a commitment to strengthen these partnerships in order to create new and more comprehensive solutions to big problems like emergency preparedness and electricity resilience. As we see in the example of the technology industry, creating these lasting networks between sectors can be a difficult, but necessary process in areas where sharing of best practices and information is needed for lasting results.